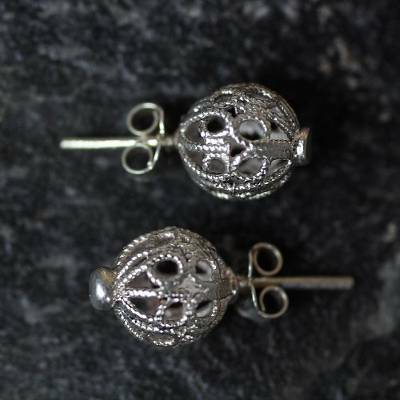 By Joycelyn Sena Zigah, these beautiful earrings are crafted by hand in exquisite filigree. She works in polished sterling silver. Joycelyn Sena Zigah has received 5 microcredit loans with 0% interest from Kiva and Novica, the first for $1100 and the most recent for $2000. This are beautiful earrings and they are very feminine looking. They came in a beautiful package and it was a great display. I would definitely order again. They are perfect to dress up an outfit or for a relaxing weekend. Great buy! "A challenge was working in a male-dominated industry. Coming from a very traditional setup, it was tough as a woman to be taken seriously in the trade by my colleagues, who are mostly men." "I was born more than five decades ago in the town of Adidome in the Volta region, where my parents lived at that time. In those days, African traditional religion of worshiping at shrines was predominant. When my mother was due to give birth to me, my grandmother believed that the midwife in the town where she lived had some sort of bad energy that caused all the babies she delivered to die mysteriously soon after birth. With this belief in mind, she refused to let my mother deliver me there. "So on the day of my birth, they had to travel miles to the hospital in the next town for me to be delivered. It was a very grueling experience for my mother and she has considered me special after that experience. My name, Sena — which my mother appropriately named me — means 'bringing heaven to earth' in the language of the Ewe people of Ghana. "The Ewes live mostly in the Volta region of Ghana, east of the Volta River, and we are the second largest tribe of Ghana. I grew up in Hohoe but later left for Koforidua in Eastern of Ghana for my secondary school education, and then attended the university in Kumasi. "As an art student, I became interested in industrial arts — specifically, metal work. My mother traded in earrings, necklaces and beads so I naturally followed up. In 1986, I graduated with a bachelor's degree in art, with a major in metal design and fabrication. "Immediately afterward, I worked as a jeweler's assistant for my National Service, a scheme designed for new graduates to serve their country for a period of at least one year. I did this for two years and was later employed permanently as a jeweler. Two years after that, I had the opportunity to further my studies at the School of Jewelry in Birmingham, UK. This was a great opportunity to learn more techniques and upgrade my knowledge in my chosen field. "After successful completion, I returned to Ghana. I was eager to pass on the knowledge acquired and to help develop the jewelry industry. I chose a public institution where we took in most of the graduates from the metal arts department of the University of Science and Technology. This gave me the opportunity to impart this knowledge and put to use my skills in the industry. I rose to become the head of the jewelry workshop and worked with the company for a total of fifteen years. "From there, I was ready to start my very own jewelry workshop. I initially started with a staff of two, which has gradually increased to five permanent staff and five casual workers. I also take in many apprentices and interns from the university, whom I train during vacations. "The initial challenge faced when I started on my own was pre-financing production of the precious metal designs I produce. Material costs were very unstable and any time you allocated a budget for production, the figures changed at the time of purchase. It was and still is challenging, but manageable with help from family and friends. "Another challenge was working in a male-dominated industry. Coming from a very traditional setup, it was tough as a woman to be taken seriously in the trade by my colleagues, who are mostly men. I am one tough cookie so I don't get pushed over easily. I persevered and worked harder until I earned the respect due me. "My aspiration for the future is to expand production to train more youth to equip them with skills for their future development, and also make more facilities available to students from the jewelry schools to undertake practical attachment training at my workshop. "I am the mother of three girls and I have thirteen siblings located all over the country. My friends describe me as hardworking, disciplined and honest. I like to spend my leisure time reading and playing board games with my family. I am actively involved in activities at my local church and am part of the evangelism department, which does village outreach programs. "I am grateful for this opportunity to sell internationally through Novica and I pray this draws me one step closer to fulfilling my aspirations. I also hope you will take pleasure in wearing my designs." I ordered the ""New Adinkra"" pendant - it looks even better than the photograph. Really imaginative and elegant in its incorporation of the symbol and the bird. It's a wonderful way to communicate an inspirational message. I'm wearing it today, and I know I'll be wearing every chance I get! I'm going to be ordering other pendants from this truly talented and remarkable jewelry artist very soon. Just received these wonderful ""Back to My Roots"" earrings today. To say they are beautiful is an understatement. They arrived so fast and packaged so beautifully! I am one of those who cherishes everything about this purchase, the meticulous packing, the skill work of artist. I am sure to enjoy these earrings for a very, very long time. Thank you Joycelyn Sena Zigah for creating such a wonderful reminder that it is necessary to look back in order to appreciate the present and look towards the future.